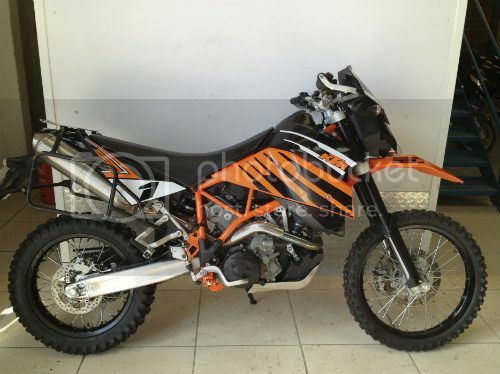 KTM 950 Super Enduro 950RSE Owners Forum • So you want to own a KTM 950 Super Enduro? So you want to own a KTM 950 Super Enduro? Congratulations on your first step to owning one of the finest bikes ever produced. There is nothing like ripping it up on a KTM 950R SE Super Enduro whether its on the road, track or dirt this is one sweet ride. If you have any questions ask away here as we hope to build the definitive community of 950 super Enduro Owners. Why all the fuss? Well apart from 950CC and 94 brake and unparalleled balance, torque and a grin only your mother can wash off these things are rare! Rumour has it there were only ever 200 produced, (which I don't believe but don't know for sure) they were all made in one production run and people started to get them mid 2006 until all sold in 2008 and a special edition Erzberg Rodeo in 2009. So ask away and the lucky few that own one will help you out. Re: So you want to own a KTM 950 Super Enduro? For sure not 200 produced, that's way too low. I think KTM was allowed to produce a maximum of 5000. Worldwide that is. If they reached the number of 5000 is unknown to me. There was only one production run, the Erzberg was a marketing effort that covered it with a bit of bling to shift units. The fact there was only 500 units made makes me want one even more if that is correct. I love rare machines and that alone would swing me over the adventure model. Looking at buying the 950R SE. Does anyone know the bike? It has 25,000 miles on the clock, what should I look out for where the racks are concerned. I have read the subframe should have been reinforced for these racks with paniers??? I'll be travelling form Ireland to the uk to buy it so any help would be appreciated. The above bike is now sold so no need for replies lads. Been watching it ages. I took a deposit on my 640 Adv today. Typical. All the rest are to pricey for me.